Congratulations on your new home! Now you have to figure out how to efficiently pack up your home. Luckily, we have some tips that can help you without breaking your bank or your belongings! Throw out any unused or unnecessary belongings! This will reduce the amount of boxes you have to haul across town or across town or across the country. Anything that is still in good condition, donate to your local thrift store. Change your address two weeks prior to your move. This may seem like a no-brainer, but it’s good to get done as soon as possible. Think about utilities, banking, Amazon, PayPal, etc. Pack your essentials in an travel-easy tote or container. Chances are, you don’t want to go through boxes looking for your toiletries after a long day of moving. Keeping your essentials nearby makes it easy for you to clean up without a hassle, whether you are too tired to unpack or have to go to work the next day. Use either a large tote or clear plastic container for easy identification. Utilize any baskets, hampers, or suitcases. Cut down on buying boxes and fill baskets, hampers, and suitcases with clothes, books, etc. Use clothes, blankets, or towels to protect fragile items. Don’t waste money on bubble wrap! Use old clothes, blankets, or towels to protect your fragile items. Also, packing your dishes vertically rather than horizontally can reduce the risk of breakage when being hauled here and there. Prevent leaks by wrapping up your toiletries prior to moving. Unscrew the cap, add a scrap of saran wrap, then screw the cap back on. Now you don’t have to worry about anything spilling or exploding. Another option is zip top bags. Use a system that can help categorize your things by the rooms they belong in. 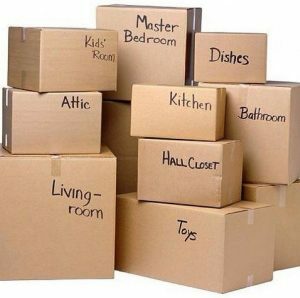 It can be as easy as writing what items are in the box and where they belong, color coding your boxes by taping on a scrap of colored paper, or having a number system. Take a picture before you dismantle your technology. It’s frustrating when you move into your new home, and it takes hours to set up your tv or computer. Take a photo of the cord connections before you dismantle, so you have something to reference when you put it back together. Plan out your moving day a month in advance. Hire movers at least a month in advance on a slow weekday, like Tuesday. Map out your route whether you are driving across town or across the country. You want to make your moving day as efficient as possible. Schedule tasks that need to be done within a month, leading up to the big day. Ask family and/or friends ahead of time to help you. Load heavy furniture into the moving truck first so when you unpack you can get the lighter things out of the way fast and efficiently. Keep sandwich bags handy for small pieces and screws. Set up the bed first. After a long day of moving, you don’t want to spend another few hours trying to set up your bed. Set up your bed first, then do the rest. You’ll be happy later that you made that a priority. Take good care of those who are helping you move, whether they are getting paid to help or not. Supply good food and drink! Keep calm, have a great move, and again, congratulations!